A marmalade-loving bear with human level intelligence loses his home in “darkest Peru” and sets off for London in PADDINGTON, a live action film based on the beloved series of children's books. 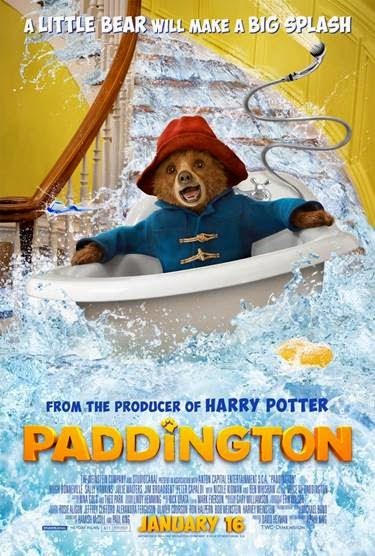 In London, Paddington (voiced by Ben Whishaw) is found by the Brown family, and while Mr. Brown (Downton Abbey's Hugh Bonneville) is against it, Mrs. Brown (Sally Hawkins) and children Judy (Madeline Harris) and Jonathan (Samuel Joslin) convince the safety-conscious patriarch to let the bear stay, at least until other arrangements can be found. Meanwhile nasty museum taxidermist Millicent (Nicole Kidman) plots to get her hands on our furry hero so she can stuff and mount him, which she just might do with the aid of the Brown's fussy neighbor Mr. Curry (Peter Capaldi). It's been ages since I've read (or had read to me, as the case may be) a Paddinton book, so I'm not sure how closely all this reflects the source material. My understanding from what I've read elsewhere is that no one book in the series is adapted here, but that most of the scenes are taken from one story or another. The more action-oriented plot involving the taxidermist seems out of character with what I remember, and was probably included to give film a plot that could hold a 90 minute movie together. Regardless, there's plenty of good natured slapstick laughs and genuine warmth to be had in PADDINGTON. Combined with a solid cast and production values, it makes for a highly enjoyable family film. That said, the implied demise of one of Paddington's fellow bears (my guess is he'll be back if there's a sequel, but still...) and the rather dark nature of Millicent's scheming might be a bit much for some of the more sensitive tykes in the audience. 3 out of 4 stars.